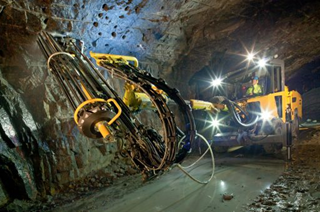 Atlas Copco is launching a new, compact rig for rock bolting in small to medium sized tunnels and drifts. 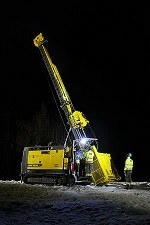 The rig, called Boltec S, is fully mechanized and can operate in drifts as low as 2.8 meters and up to 7.5 meters. The new Boltec S from Atlas Copco. The Boltec S can be equipped with the new, 14 kW COP 1435 rock drill offering up to 30% faster drilling than the lighter 11 kW COP 1132. At the same time, both rock drills are built from the same, short housing parts, giving maximum room for installing longer bolts. Another feature is a new operator panel with only two multifunctional levers that control the whole operation from drilling to bolting. A new resin injection steering system, which is also controlled from the operator panel, makes the loading of resin cartridges into the pre-drilled hole a lot easier since it is not necessary to move the whole bolting unit. The bolting unit is mounted in a forward facing position. This makes it easier to install bolts in both the left and right hand corners, and also allows for face bolting when necessary. The bolt carousel can be loaded in a vertical position, resulting in a much faster re-load time and a better working environment for the operator.